The course, blessed with stunning views from all sides, with the Bay of Lagos to the East and the impressive backdrop of the Monchique Mountains to the North, is a stern test for golfers of all standards. With two distinctive sections the course offers a variety of holes commencing with the welcoming first hole, a meandering downhill par-4, bordered by beautiful sub-tropical landscaping leading to harmoniously designed properties. 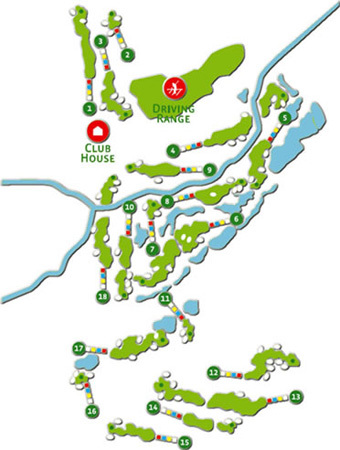 The first nine, in general, climb to the highest point of the resort, where a pause at the eighth tee will allow one to experience panoramic views. Subsequent holes descend to an area where water features, streams, lakes and arched bridges, reminiscent of landscaped gardens abound. Without doubt the Signature Hole on the outward nine is the stunning par 3, 6th Hole, at 194m one of the most challenging par three holes in the Algarve.